The Great Dane is considered a Wonderful and Regal Pet, A Gentle Giant, The Apollo of Dogs. 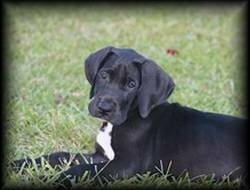 The Great Dane is known as the Gentle Giant for a reason, they are extremely loving and caring. They are a calm breed and love to be with their family. The Great Dane is a wonderful breed with many great gualities, but it is not the breed for everyone. 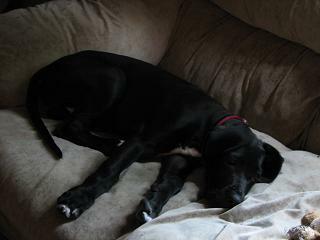 The novice owner has a responsibility to their Great Dane to seek the advice and guidance of established, experience owners, and/or experienced owner. 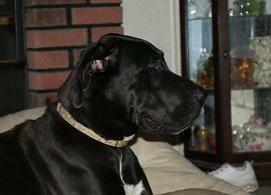 The Great Dane is an indoor dog, people and family oriented, and in need of quality attention. Because of their large size training from an early age is very important, mostly to teach them manners such as not jumping up, leaning against people, or knocking people down. Socialization is also important at a young age as some Great Danes can be slightly dog-agressive if they are not properly socialized. Science has showed that as people take care of their pets, the pets are taking care of their owners. A recent study published in the American Journal of Cardiology found that having a pet can prolong his/her owners life. Pet owners generally have lower blood pressure, and pets help their owners to relax and keep more physically fit. It was also shown that pets help to keep the elderly connected to their communities. The beauty of dogs is that spending time with them brings us closer to our natural selves. They relieve stress, improve our health, and keep us in touch with the fact that true happiness exists only when we live in the moment. Veterinarians in Nova Scotia will no longer cut the tails and ears of dogs for cosmetic reasons, prompting an outcry from some breeders. The Nova Scotia Veterinary Medical Association is forbidding its members from doing surgeries that alter an animal's appearance solely for cosmetic purposes. Veterinarians say docking a Doberman pinscher's tail, for example, is unnecessary and cruel. "In my opinion, Dobermans and Great Danes look great with their ears down and their long tails, so there's no reason to mutilate them by causing them to meet an arbitrary breed characteristic that has been around for so long that we can't remember why it's been around in the first place," said Dr. Frank Woodbury, a veterinarian in Halifax. The Great Dane has complete and utter devotion to his family, for a gentle, dignified, loyal friend, there really is nothing like a Dane. Adult Great Danes possess both power and elegance in large portions. Giant Dogs bring giant responsibilities. It is crucial that any Dane owner or prospective Dane owner understand this. The Great Dane is nothing short of majestic. Sometimes referred to as the "king of dogs," this extremely large dog breed is known for being strong yet elegant, with a friendly, energetic personality. Striking in the show ring, this breed is also popular as a family pet. Coat colors can be brindle, fawn, blue, black, harlequin and mantle. AKC Announces Most Popular Breeds In U.S. Response Products of Broken Bow, Nebraska has issued a voluntary recall of two lots of Advanced Cetyl M® Joint Action Formula for Dogs because the products may have been contaminated with Salmonella. The supplements are sold through veterinarians and online and other retailers. No illnesses have been reported to date. The affected lot numbers include 1210903 and 128010. For more information, contact Response Products at 1-877-266-9757. The popular 18th century poet, Alexander Pope was a great admirer of the Great Dane. In fact, his dog Bounce saved his life, one evening when a servant attempted to slay him. The servant broke into the Pope's quarters and tried to stab him. Springing to his master's defense, Bounce attacked the intruder and prevented what could have been a savage murder. How to say "Dog" while traveling abroad: hund in Greman, inu in Japnese, chien in French, kringmerk in Eskimo, skylos in Greek, gao in Chinese, hond in Dutch, kutta in Hindi, kelev in Hebrew, pies in Polish, sobak in Russian, perro in Spanish, soonahk in Thai, and inja in Zulu. The PETS (Pets Evacuation and Transportation Standards) Act of 2006 became law after thousands of pets perished in Hurricane Katrina. People evacuated from New Orleans were not allowed to take their pets with them.